China bans Symantec and Kaspersky from providing software to Govt. China is back to their instinct of banning foreign products and this time it’s Symantec and Kaspersky. Countries like Russia and China are banning foreign technology products and encouraging use of country made products. China banned Microsoft Office and now use a China made office tool. Now the government is withdrawing Symantec and Kaspersky software to encourage use of nation manufactured products in government sector. 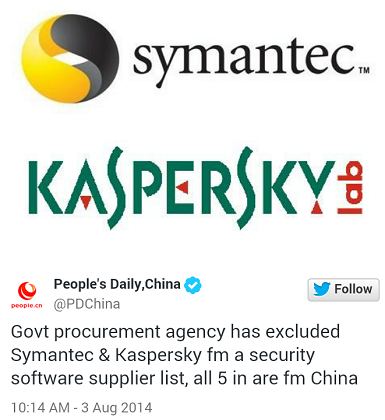 People’s Daily, the largest circulated news paper in China reported on Twitter that China has barred the use of two top class security providers, the Kaspersky and Symantec from providing any further service. Now all the five agencies that were responsible for government software procurement are China based companies. The companies which are approved are Qihoo 360 Technology Co, Venustech, CAJinchen, Beijing Jiangmin and Rising. The tweet is as follows. Few months back China banned Windows 8 and Office and using the Chinese counterparts. But according to many, it’s not just promotion of national products but is perhaps the result of retaliation against the United States. The US government accused Chinese military for cyber crime and espionage.